Are single-gender schools still relevant? The all-girls or all-boys school is a well-established tradition that offers students a modern education option. There are increasingly more options when it comes to high school education. STEM, STEAM, IB, private, parochial…as well as a model that’s been around for centuries: the all-girls or all-boys school. It may be one of the most relevant options today. Sometimes dismissed as old-fashioned, single-gender institutions, according to several studies, create an environment that fosters social and academic skills needed in today’s world. The National Coalition of Girls’ Schools and the International Boys’ Schools Coalition, among others, have studies that point to higher satisfaction among graduates from single-gender schools. A 2009 report from Dr. Linda J. Sax states that girls who attend all-girls schools graduate with more confidence, are more likely to engage in college activities and more likely to seek out a professor for support. Girls often take more risks and engage more assertively in a single-gender environment, while boys tend to display more kindness, appreciation and collaboration with their peers. The classroom becomes a place of true exploration when students shed the need to prove themselves to the opposite gender, and opportunities for representation in every sphere increases in single-gender settings. For girls, this often means finding their voice, and using it to speak up. In single-gender schools, students can easily examine and try out various styles of leadership because roles are based on who truly models and encompasses a club or group. 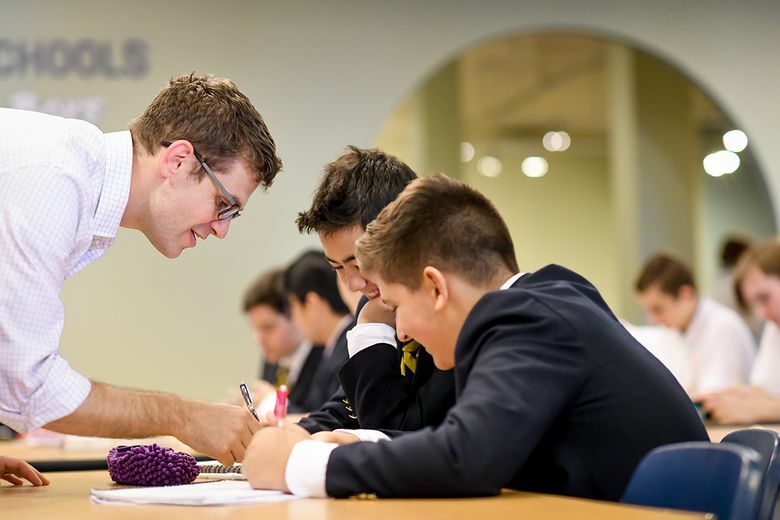 “Eschewing stereotypes, [students] discover they have many roles to play as a scholar, athlete, artist, musician, and friend,” remarks the International Boys School Coalition. Susan Bauska, director of the Annie Wright Upper School for Boys, has now experienced teaching in coed schools as well as in single-gender ones, both in an all-girls environment and now an all-boys one. She concurs with Holland about girls being empowered in a single-gender format. Boys on the other hand? She’s noticed a sense of empathy and collaboration among what is a true cohort of boys — something that could be missing in coed classrooms. It’s not a case of either-or in an all-boys’ school — either toughness or compassionate relationship; it’s both. Rising Annie Wright tenth grader McHardy Bryant, for example, rides mountain bikes and last year pitched for Stadium High School’s junior varsity baseball team. He also will be the first male student ever to sit on the AWS dormitory honor council, hearing disciplinary cases of his peers and serving as a compassionate advocate, helping fellow students to make better decisions. Athletic toughness can and should go hand-in-hand with empathy. Founded in 1884, Annie Wright Schools serve students from age 3 through high school. Annie Wright Lower and Middle Schools offer coed programs in preschool through grade 8. Separate Upper Schools for boys and girls offer day and boarding options in grades 9-12.